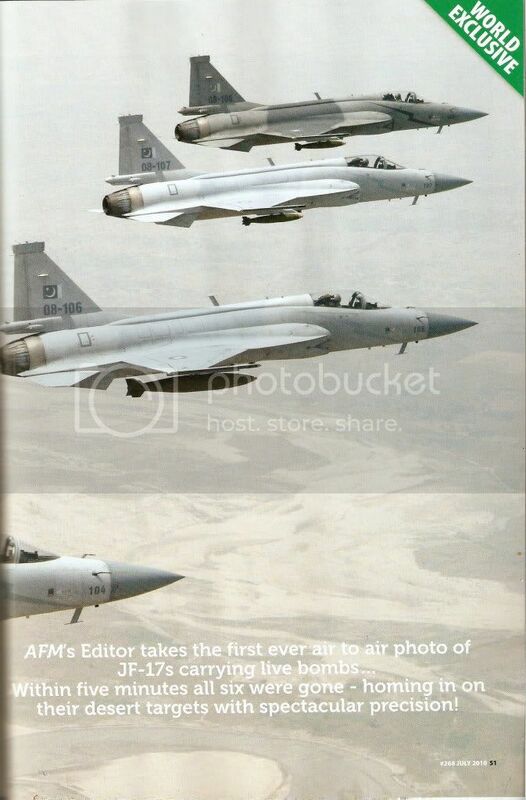 Guys, I've just picked up a paper copy of this month's Airforces Monthly hot of the press and can confirm that they have just revealed exclusive news about the JF-17 debuting at this year's farnborough airshow. I can't post a link so it's up to you if you believe me or not. Either way, I live in London so I'll be booking my tickets online as I was intending top go any way but this news is bonus. If any other UK based member wants to go then message me so we can meet up there. The dates are 24-25 July for public viewing. I'll check and confirm this. Seven years after making its first flight in China, the JF17-Thunder is set to make its international debut at the Farnborough International Airshow 2010 (FIAS10) on July. The presence of the Sino-Pak jointly developed JF-17 is likely to steal this year's show, which takes place from 19-25 July, as Pakistan Aeronautical Complex sets about marketing the aircraft to an international audience. The aircraft has been going through test and evaluation since the Pakistan Air Force (PAF) recieved its first two examples from Chengdu Aircraft Corporation in July 2007. The first operational unit, 26 Squadron, stood up at Kamra-Mnhas in February 2010. The PAF has a requirement for around 250 of these single-engined lightweight fighters, which will eventually replace all of its A5IIIs, F-7s and Mirages. Last year, PAC Kamra started it's own assembly line which saw the first aircraft rolled out on November 23,2009. Both aircraft are expected to fly from Pakistan to Farnborough International with a C-130 Hercules acting as support. It is likely that the pair will be equipped with Chineses avionics, including the KLJ-7 radar, as there have been some delays in aquiring the Western systems. 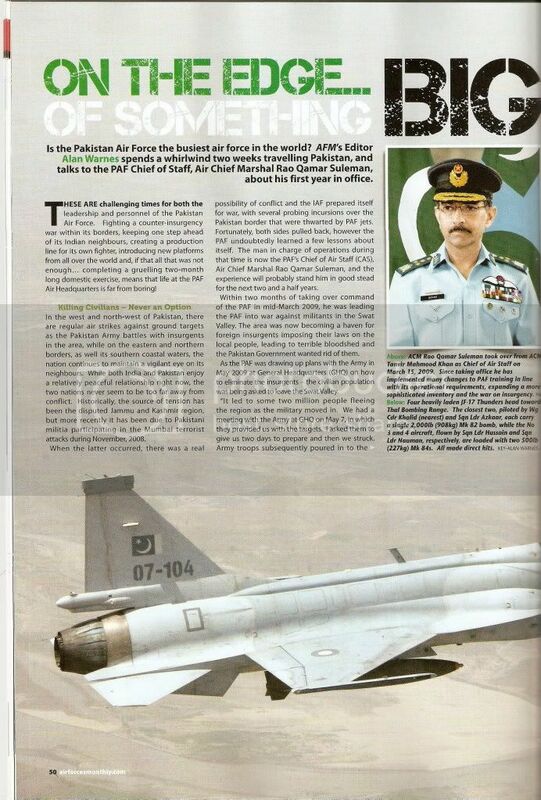 In early April it was reported that the French Government would not supply the Thales avionics to the PAF for the JF-17; however, the Chief of Air Staff, Air Chief Marshall Rao Qamar Suleman, told AFM in mid-April that the French Procurement Agency the Direction Generale l'Armement (DGA), had assured him that delivery would go ahead. Meanwhile, the PAF will continue flying the JF-17s with Chinese avionics and is even contemplating operating two systems in parallel. Having been affected by Western sanctions in the past, the PAF is not willing to risk any further delays to the development of the aircraft. Many Third World countries have shown interest in the attractively priced export version of the lighweight fighter that will not include any US components - Egypt is considering setting up its own production line, as it has done on another Sino-Pak project, the K-8 Karakorum jet trainer. The PAF is also expected to participate in it's first Excercise Red flag at Nellis AFB, Nevada, in August when it takes up to eight F-16A/Bs to mix it with the USAF's best. Separately, the first four new F16C/D block 52s are expected to be delivered to PAF Base Shahbaz, Pakistan, in late June. Meanwhile, on May 21 the USAF awarded Lockheed MArtin $325.5 million contract to provide for the development, integration and delivery of 35 mid-life upgrade kits for the PAF Foreign Military Sales F16A/B Block 15 aircraft. The contract also includes retrofit kits for the new F16C/D Block 52s. 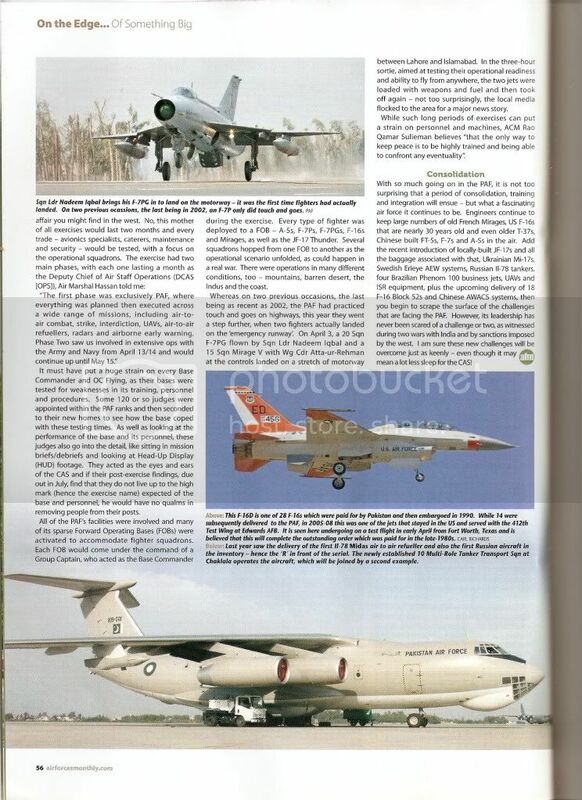 For more on the PAF see 'On the Edge of Something Big, p50-57/59-62'. I'll try and update this other stuff where I can. It's almost ten pages worth so I'll try and summarise it for you in my own words. I shall try and see it too!!!! Now lets see if I can get there on time to get a glimps it’s a bloody chockablock in London all the time, the Farnborough plane-spotter blogspot definitely says JF-17 will be displaying flown by PAF. Beginning with some small news items before I move on to the bigger stuff. ALL FOUR of the Embraer EMB-500 Phenom 100 executive jets that were ordered by the Pakistan Air Force (PAF) are now in full operational service. The aircraft are all flown by 41 Squadron, based at PAF Base Chakala, Islamabad, for various roles, including VIP transport, liaison and communications. Pakistan placed the order with Embraer for four of the type in 2008 and the first example, V4101, was handed over at the Embraer factory at Sao Jose dos Campos, Brazil, on March 24, 2009. The aircraft was then delivered to Pakistan in April 2009 while the second Phenom, V-4102, followed in June. The third Phenom, V-4103, then joined them last September. The final aircraft V-4104, was delivered at the end of 2009 and was noted passing through Dubai on December 29 during its delivery flight. Two upgraded ex-US Navy P-3C Orions were formally transferred to Pakistan Navy on April 30 at Naval Air Station Jacksonville, Florida. Modifications to these aircraft, serials 86 (ex 159510) and 87 (ex 159511), were completed by Lockheed Martin some time ago. Since then, both aircraft have been crew training at Jacksonville with US Navy Patrol Squadron VP-30. They passed through RAAF Edinburgh, Australia on May 17 on delivery to Pakistan. The aircraft are the first from a batch of eight aquired by Pakistan following storage with the 309th Aerospace Maintenance and Regeneration Group at Davis-Monthan Air Force Base, Arizona. Seven are to be modernised, with the eigth being used purely for spares. The final delivery is scheduled for 2012. AS DELIVERY nears of the first new Block 52 F-16C/Ds for the Pakistan Air Force (PAF), preparations for their arrivals are well under way. At Tuscon International Airport, Arizona, a graduation ceremony was held on May 4 for the first eight PAF Pilots to convert to the newer F16C/D model with the 162nd Fighter Wing, the Air National Guard's International F-16 training unit. All were existing PAF F-16A/B aircrew, who are now almost ready to transition to the much more advanced variant. In a final phase, as the training at Tuscon has been on Block 25 Aircraft, they will spend two weeks of additionial Block 52 instruction with Lockheed Martin at Fort Worth, Texas, before they return home as instructor pilots. They are the first Pakistani F-16 pilots to train in the USA since 1983, when the last class graduated at Luke AFB, Arizona. Lockheed Martin was awarded a contract on December 31, 2007, to supply Pakistan with 18 Block 52M F-16s, comprising 12 single seat F-16Cs and six twin-seat F-16Ds, under the Peace Drive I programme. The first of these F-16D 10801 (c/n JF-1, USAF/07-0013), made it's maiden flight at Fort Worth, Texas, on September 29, 2009, and on October 13 was officially unveiled there. Delivery of the first four aircraft to a new squadron at Shahbaz Air Base, near Jacobabad, Balochistan, is scheduled for June 26. The airfield was previously a forward operating for use in times of war and has not previously had any permanent residents, although it has in recent years been used by the USAF to support operations in Afghanistan. Over the last year, a major upgrade of the base has been undertaken in readiness for arrival of the F-16s. Mind if you can scan the articles? 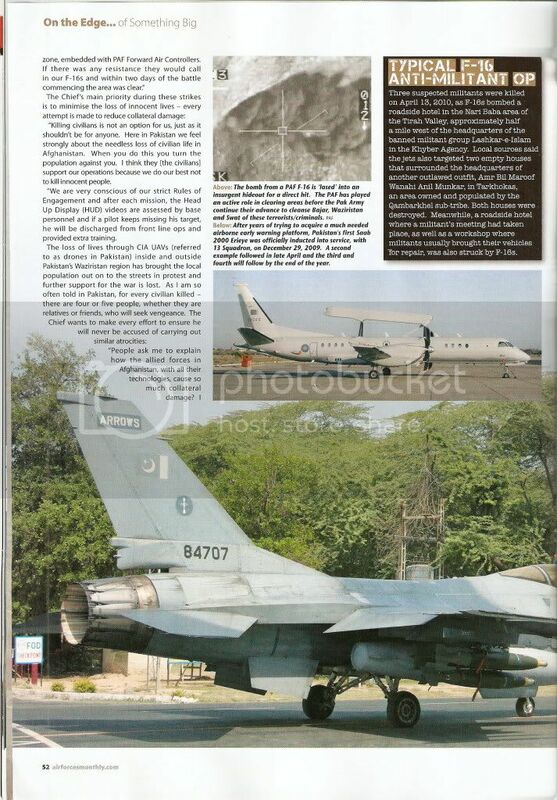 can see JF-17 at frontpage, but thats about it. 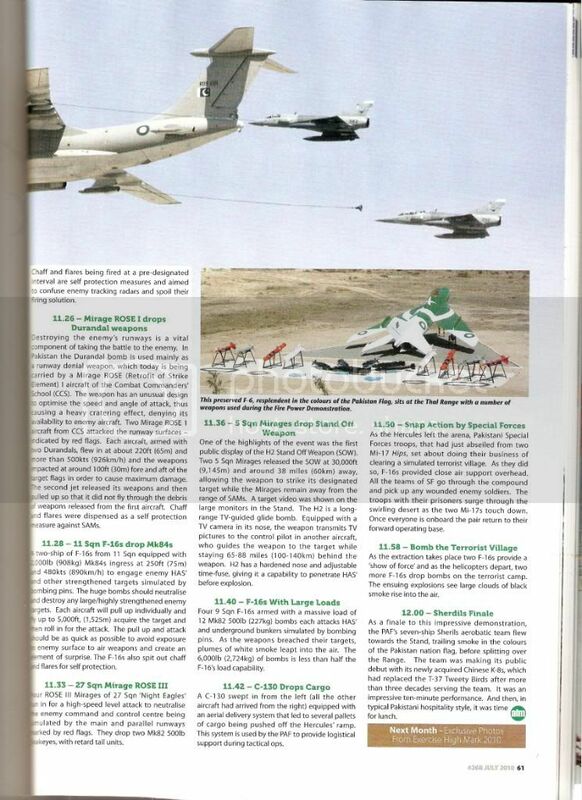 Seems to me that Shabaz Air Base will become a fully operational air base for Pakistan Air Force. Its interesting to know that the Americans use Jacobabad (Shabaz Air Base) for its supply drop zone. Very shewd choice, away from Peshawar, away from Karachi and safely in the middle of a sparsley populated area in Pakistan's Province of Sindh. It is also Bhutto area and considering the zardari is their pet dog, thats another added safety assurance. Plus with Blk-52s being stationed in Shabaz Air Base, means they will have quite a presence their already. According to Google Earth satellite images, work was ongoing at Shabaaz and it is big with atleast 36 reinforced hardened shelters and the size of the base can best be described as the size of Jacobabad city itself!!! 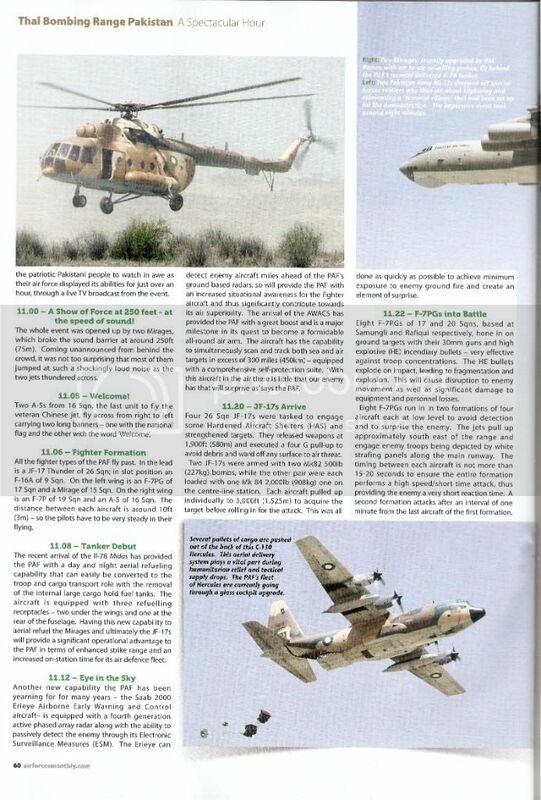 Airforce Monthly June 2010 continued.. While the PAF has been a regular participant at excercises in Turkey (Anatolian Eagle), Saudi Arabia (Saudi Sword) and UAE (Advanced Tactical Leadership Course- ATLC), until now it has never attended what is probably the world's premier excercise - Red Flag. However, this summer that is going to change when the PAF will despatch up to eight F-16A/Bs to Nellis AFB, Nevada and provide their personnel with a chance to measure themselves against some of the most capable pilots and technologies in the world. 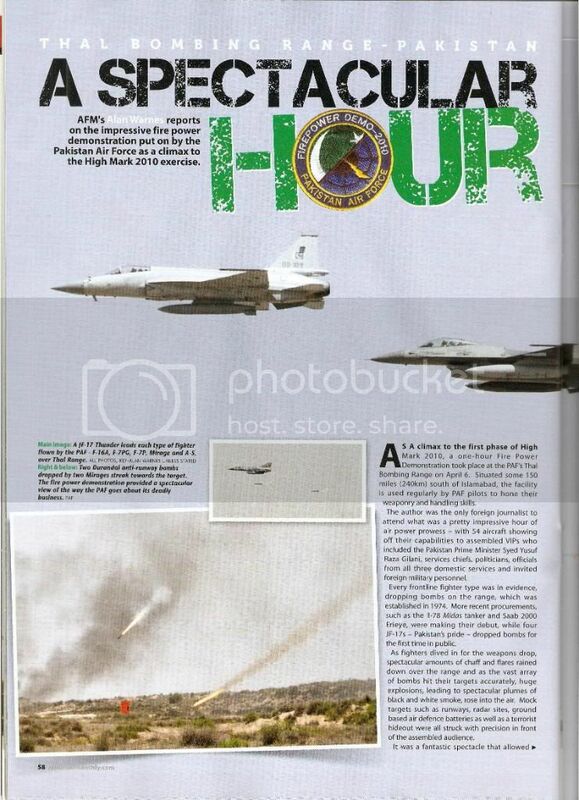 In late June the first of 18 F-16 Block 52s (comprising 12 F-16C and six F-16Ds) ordered in December 2007 as part of Peace Drive I, are expected to arrive at the recently modernised Shahbaz Air Base, Jacobabad. These state-of-the-art F-16s will bring new technologies like Joint Helmet Mounted Cueing Systems, Conformal Fuel Tanks (CFTs) and advance electronic warfare systems. However, the CAS confirmed to the author that CFTs will not be used regularly. Eight F-16 Pilots graduated from their Block 52 tactical training with the 162nd Fighter Wing at Tucson ANGB, Arizona, on May 4. The bulk of their flight training at Tucson included a transition course from the F-16A/B to the F-16C/D, flight lead upgrade training and instructor pilot certification. One of them, squadron leaderGhazanfar Latif, explained many of the benefits of this new generation F-16. "It will make a big difference because we do not have the capability to carry out precision engagements at night on our F-16As. Everybody understands that collateral damage plays a big factor during war and the sensors on the C-model will help us carry out precision engagements and better close air support. ". "The radar, datalink and other avionics help create the bigger picture of what is going on around you. There is a lot of information to process in the C-model, so you have to prioritise all of the output you are getting." After the graduation, the eight pilots will go to Lockheed Martin at Fort Worth, where they will go through two weeks of additional Block 52 instruction before returning to Pakistan. 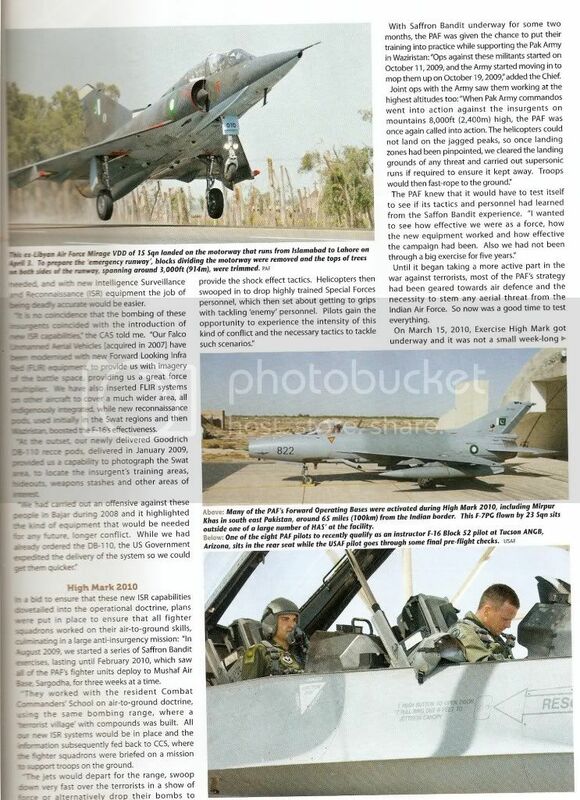 Meanwhile, the PAF's existing fleet of Peace Gate I/II Block 25s will undergo a Falcon Up mid-life update in 2011, designed at upgrading cockpits and avionics to match the F-16C/D. These will be augmented by an additional 14 F-16s that were never delivered because of the Pressler Ammendment passed back in 1992, which led to 28 F-16s being embargoed in the USA. Although 14 were eventually delivered in 2007/2008, the PAF declined to take the other 14 that were on offer as they were deemed unsuitable, but now, after nearly 20 years of waiting, they will finally recieve replacement aircraft. The PAF, which places much emphasis on the F-16, because of its capabilities and load factor, will then operate one of the largest F-15 fleets in the world. Sorry, don't have access to scanner plus no guarentee how they will turn out. I'm off work today so will keep updating as and when I can so please be patient, I'm not the fastest typist. Yea thats the thing I am worried about as well. All those alarms start to ring about americans having tight checks and physical presence in Pakistan to keep an eye on these brids. why not Sargodha, Peshawar or Masroor? PDF owes u big time. Edited by sobank, 07 June 2010 - 07:08 PM. Thanks Hala. I was just in the middle of doing this when I clicked refresh. You've just saved me duplicating this. Nice one old chap. Well, I hope to be in Farnborough so message me people and we'll plan and enjoy a good day out. Mods, please remove my previous post with the feeble attempt at putting the image up. Thanks. Thanks very much for your effort in bringing this to us Shazman! Please do take snaps and possibly video recording! Thanks and also please don't forget Hala. A big thanks to him as well for posting these images. Thanks again matey!! Inshallah, I will make both a movie and take some pix. I still can't believe the Thunder will be here in Farnborough. I do agree with Alan Warnes/AFM, it's going to be the star of the show. Most airshows show pretty much the same fighters every year albeit in upgraded form but how often does a completely newly designed fighter come along frseh from the drawing board come along - especially one that has been designed by an air force!! I think for this reason and the fact that it is a non-american,european and russian aircraft makes it a strong attraction for air enthausiast. I hope they have an air demo as well as static ground display. I'd love to get my picture taken in the cockpit if I could. Don't know if that will be possible. I'm also dying to see the A380 Super Jumbo. Man that is some serious peice of engineering. What amazing capabilities has Allah given mankind. It's a sign of his splendour when he gives us such intelligence and skill. Oh My apologies .... yes Hala too - thanks very much. Much appreciated. Thanks bro! Looking forward to the eye candy! Schedule and list of aircrafts on display. Good job Shazman and hala. 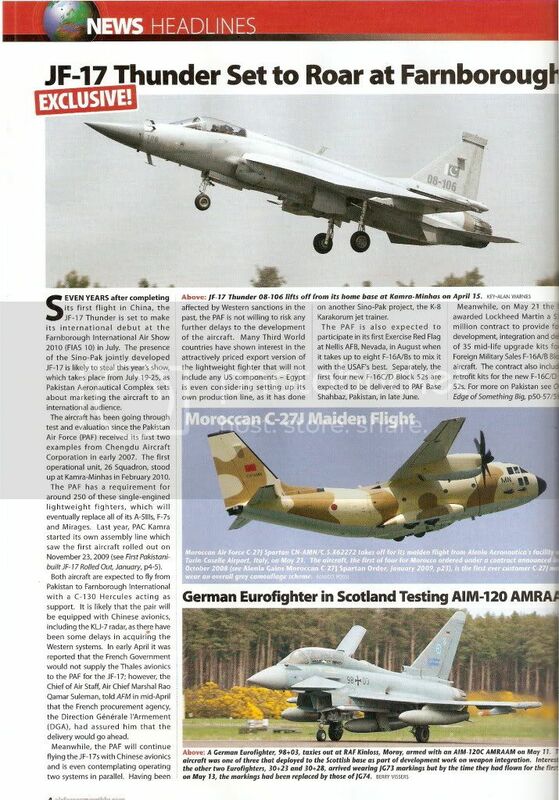 1- Learn what OCR can do when scanning magazines.............. it will help you in future. In old corel draw program, it was called ocr trace. 1- better camera is a plus. 3- Take your laptop, take pictures of fast moving objects and view them on lap top. just to make sure everything is working fine. 4- Try to take a spot where sun is at your back. If it is in constantly in your eyes then photos will be screwed for sure and you wont be able to enjoy the show either. 5- its better to shoot and make movies at the same time i.e. give one person Video camera and take pictures yourself. Take a camera stand with you. cause other wise when you gonna zoom in, the camera shake will ruin everything. And trust me regardless of how steady is your hand, on zoom everything messes up. oh and dont wait for right moment. just keep snapping. you will get many good shots without losing anything. and get those battery charged . Oye tipu786 anything to add? Oh and before i forget................... where is LCA? LCA doesn't fly, it's no eagle. It jumps branches, like hops from tree to tree. They may want to take a dhancha with them, like they showed off a defective drone in one of the shows that was supported by steel scaffoldings. Back to topic - Thanks Shazman & Hala. If any of you would read the article you will notice the CAS confirming that the French deal is NOT Cancelled. Shazman / Hala .. you made my day. Thanks both to both of you for your effort. Also looking forward to next month's issue as it's supposed to have exclusive pics from High Mark 2010. Sobank, thanks for the tip dude, maybe you should come over yourself. I don't have state of the art camera equipment as such, just a normal digital 12MP camera with 4 X auto zoom although it does have settings for fast moving objects so I will take those tips on board. It is also anti-shake as well. The thing is carrying a laptop and stand around for a full day in one of the world's biggest airshows will be no easy task. It will also be harder when you are brown faced arab look-a-alike like us Brit Paks are and anyone can call security at a whim. It's still a tense atmosphere here in the UK, maybe not as bad as the US but I'm always wary. I was going to book a hotel there and stay the full weekend but I know how it can look when I'm there on my own with all my equipment. Maybe I should just slap a load of tibet cream on and become white for the day. If I can meet up with anyone else then we'll see what we can do. Also remember the place will be full of air enthausiasts, some really experienced ones and you will end up seeing the JF-17 Videos on Youtube as well plus an official Farnborough Video will be made available. All the same, I'll give it my best shot and post my own personal experiences of the day in the images forum. 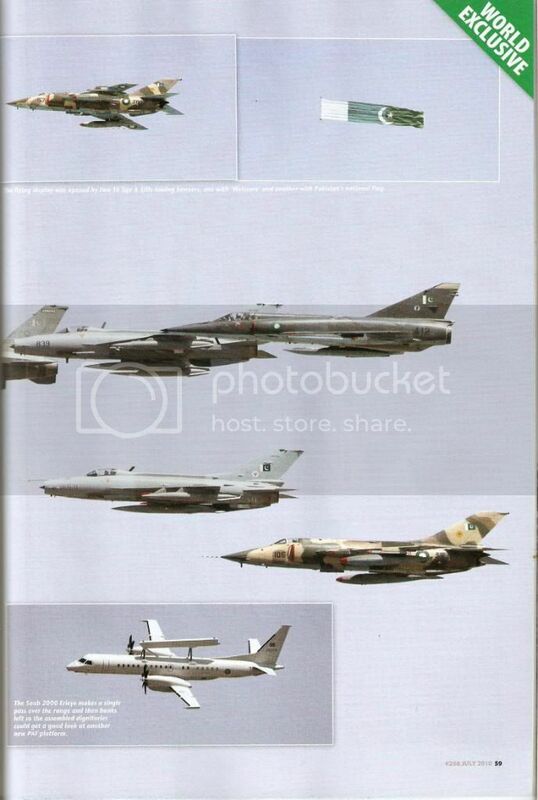 How could you miss the JF-17 on page when it is their shining with two bombs under the wings. OPEN YOUR EYES MAN. •Face detection up to 5 faces. •Continuous shooting up to 1 frames per second. •Movie capture and playback with sound. •Accessories included: USB cable, AV cable carry strap. Dont worry yaar camera will do. just disable the digital zoom. Regarding image stablizer, well I dont know much about it. I dont think Tipu786 uses them cause he got real good sh|t. And the lens I used to have, had optical image stablizer. anyways, by using laptop, I meant when you reach the ground, take out your camera and take a pic of any fast moving car and just check it out on lap top if the stuff is working out good. You can even try it out at home before going there. just go on the street or highway and test it. bring it home and see results. thats all. This is so that you can get a feel of things to come. As far as stands go, then there is a one legged stand. you can use that. To be honest it shouldnt be a problem but if sky is dark then you might need the stand. I never took jets picture higher than iso 400. you should take a couple of them at iso 200. if on auto function, this is automatically set then dont bother. if not then try a couple of shots on 200 if works then great otherwise go one step higher. enable the continuous shoot mode. let the camera focus properly for the first picture and then assume you have AK47 with unlimited bullet clip just keep shooting. high speed moving objects will require faster shutter speed which means pictures will be slightly darker. To compensate, the aperture will open a little more, which will reduce the focused area. higher iso will allow you more focused area and faster apperture which will result in better picture but depending on iso used, it could a little bit grainy. Then comes Photoshop stage. light can be handled easier but grainy or out focus are pain in the a$$ so make sure always take first pic when camera is done focusing, dont rush through. Thanks mate. I'll give it a shot and will try the laptop experiment as well. Hopefully weather permitting, it'll be a good day. British weather is famous for it's unpredictability. It June now and raining outside with a slight chill. Just a few days ago we had 28 Celsius with clear skies. I just accept it. high speed moving objects will require faster shutter speed which means pictures will be slightly darker. To compensate, the aperture will open a little more, which will reduce the focused area. higher iso will allow you more focused area and faster apperture which will result in better picture but depending on iso used, it could a little bit grainy. Then comes Photoshop stage. light can be handled easier but grainy or out focus are pain in the a$ so make sure always take first pic when camera is done focusing, dont rush through. Pakistan has announced plans to begin production of avionics and related gadgets for the Sino-Pak JF-17 Thunder fighter jet. The launch, announced at the Pakistan Aeronautical Complex in Kamra, outside Islamabad, is being billed as a vital move for making the country's air force "self-reliant." "A strong air force is essential for our nation's survival," said Chief of Air Staff Air Chief Marshal Rao Qamar Suleman at the ceremonial launch. 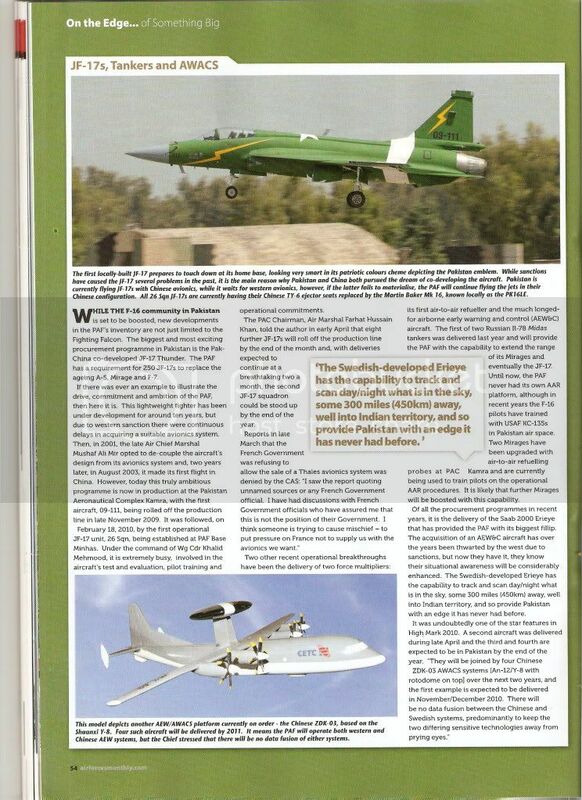 "Self-reliance for the Pakistani air force is an important factor and this ... is an important step in this direction." To date, the bulk of avionics made in Pakistan have been manufactured as part of joint ventures with foreign companies. In the past, these have included Selex Galileo radars produced for the air force's fleet of Mirage III and F-7P Fishbed fighters. On the occasion of the presentation and speaking at the Kamra manufacturing plant, Air Marshal Farhat Hussain Khan also presented an appraisal of JF-17 avionics program activities. These include four indigenously designed and developed avionics systems currently being developed at the Kamra Avionics and Radar Factory, Sify News reported. Khan said the production scope "would be progressively broadened" to include the creation of a complete JF-17 avionics suite at the complex. Neither Khan nor other Pakistani military officials elaborated on the plans. Defense News reported, however, that "at least two of the domestically designed and produced systems include a head-up display and a weapons and mission management computer." It said previous avionics projects had included a radar honing system for the 1960s F-104 combat aircraft; IRST pod and modifications to the GEC 956 head-up display and, most recently, the weapon aiming system for the F-7P jet in the 1990s. Originally known as Super 7, the JF-17 Thunder was developed by the Chengdu Aircraft Industry Corp. under a joint venture between China and Pakistan, Sify News reported. It said that the Pakistani air force was set to acquire 150 JF-17s but China's final order -- anticipated at 250 -- would hinge on the final evaluation of the fighter jet. Military experts assess Pakistan's move into domestic avionics production as an economically viable decision after ill-fated attempts in the past. 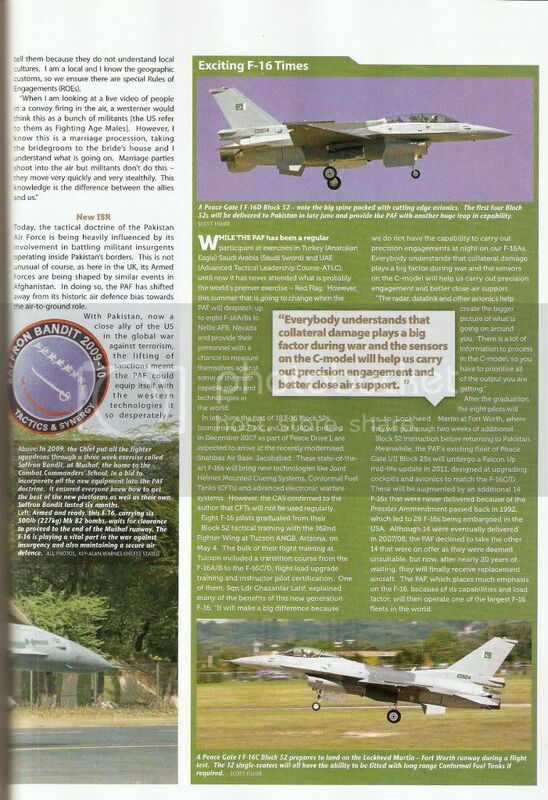 By some accounts, the JF-17 is gaining popular demand. As many as 17 nations have placed orders while Pakistan is considering deploying the aircraft in strategic parts of the country. Exports have also surged for the K-8 fighter, which is jointly designed and produced with China. "China brought in its production facilities while Pakistan brought in ideas, design from its invaluable experience using Western planes like Mirages and F-16s," Ruppe News reported. "It was a perfect symbiosis." How credible is this news? Cause 17 nations is a lot and can completely turn Pakistans arms industry around and have a signficant impact on the economy. I remember a while back that news emerged of foreign countries ordering upto 800 F-17. Any confirmations of this? In the next 2 years, all major airforces around the world are going to replace (15 to 20 year) old jets. There is a market for around 1200 planes. A home grown engine/avionics suit at that price will make this jet very attractive. If nothing else, pak's can give a guarantee that this fighter is clean - no auto switch off or secret modes built-in which can make the fighter useless whenever the europeans/US want. Hey you can buy a 60 mill fighter, but if suddenly shuts off against an israeli jet or starts broadcasting your location/info to your foe, then what good is it really? I didn't know that this was possible. The egyptians and the Turks have really large F-16 fleets, not to mention UAE with its advanced F-16s. So your'e saying if there is a conflict with say Israel, these fighters will become useless. Surely, they would know this before ordering and spending large amounts of money on them or they may have found a way to over-ride this facility if it does exist that is. Should the PAF not also be worried as there is a chance in the future it may end up fighting both India and the US? Can anybody please clarify this and what the implications and solutions are?